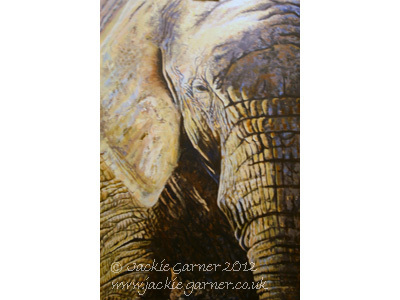 My paintings are inspired by direct experience of wildlife, so choosing an elephant as a subject created some concerns. I've never been to Africa and never seen any elephant in the wild, so painting an elephant in an African landscape felt wrong. Instead I decided to focus in on just a part of the animal so no background was necessary. As for "direct experience", I went to the wonderful West Midland Safari Park as they have two African elephants. I spent an afternoon sketching and photographing, revelling in the textures and the warm glow of afternoon light. The resulting painting is as much about mark-making, tones and colours as it is about the elephant species. I called it the Eye of the Beholder because while I was observing the elephants I felt that they were observing me just as much, leading me to question which of us was actually the beholder. Additionally, the phrase is a shortened form of Beauty is in the Eye of the Beholder and to me the textures of the elephants' skins were certainly beautiful. Why choose a limited edition print? Canvas prints are printed onto a fine weave polycotton canvas (selected for its longer lasting qualities than pure cotton), which has all the same archival qualities as my paper prints. Stretched onto a 40mm anti-warp wooden stretcher, they are ready to hang on your wall without framing. Paper prints should be mounted and framed before hanging. All prints are sold unframed. Canvas prints do not need framing. 90cm x 60 cm / 36" x 24"
60 x 45cm / 24" x 18"
90cm x 60cm / 36" x 24"
60cm x 45cm / 24" x 18"